“Blow up” in Parc Montsouris, Paris. I have been thinking again about images and photography at lot over the last few weeks, not in the least driven by my decision to purchase a new camera. After carefully reading “Digital photography review” once again, just to see how things have evolved since my last camera purchase around 4 years ago, I decided on the Olympus OMD-EM10. This is the first camera I have bought which has an interchangeable lens. For years I had wanted to buy an SLR-type camera but was always put off by the size and the weight: I wanted something I could take with me on my many trips and which wouldn’t add much to the overall weight of my bags. So a big heavy SLR with lenses was out of the question, even if they supposedly produced better images (which was not always the case, if you chose carefully). But this new camera is wonderful: it is very small, only slightly heavier than my old canon compact (G11), but it produces fantastic images. There is also a very large large selection of lenses. Yesterday afternoon I went down to Parc Montsouris with my old and new cameras and took photographs of bushes across the lake, as one does. 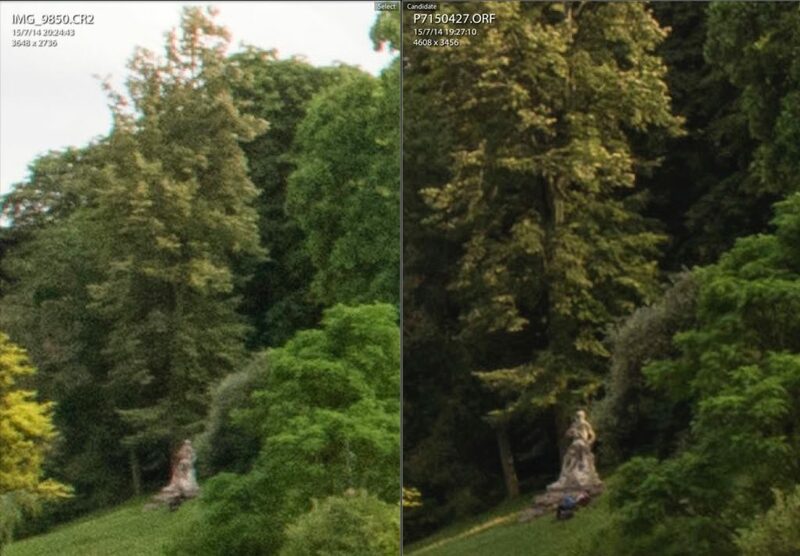 Comparing the two photographs I realised in the olympus image I could see a man lying down next to the statue, unresolved in the canon image (okay, so the focal lengths are not exactly the same). Wasn’t that just like a film from a certain Italian director? And you know the best hing? When you press the shutter button, *it takes a photograph instantly*, not like digital cameras of even a few years ago. This is not the first time I have used a camera with interchangeable lenses however. In one of the numerous cardboard boxes here I found an old Pentax K1000 camera that my parents gave to me for my first trip to Europe. They had bought this camera for taking pictures of headstones (yes,really), and they had allowed me to take it with me, that summer where I worked at the ETH in Zurich. I took maybe six rolls of film on that trip. Looking at the lens again yesterday I see that it was a fixed 50mm lens, radically different from the lenses on the cameras I had used since then all of which had zoom lenses with focal lengths of around 35mm at the wide end: most of the photographs I ended up taking, through laziness more than anything else, was with this wide end of the zoom, a view of the world completely different from the 50mm lens on the Pentax. I used this camera from 1988-2002, right up to the digital epoch in 2002 when I bought my canon power-shot S40 in Bologna for the horrendously expensive price of ~1000 euro. Now, once again, I am in the habit of using wide-angle lenses, so the first fixed-focus lens I bought for the olympus was the f1.8 17mm M.Zuiko lens — a 35mm equivalent lens. It’s an interesting experience trying to decide what fixed focal length to choose — like a lot of things today, zoom lenses I think have made people lazy. Growing up, I remember that at first photography was expensive. We had a Polaroid camera and my mother and I would go to the graveyard to take pictures of headstones with it (this was not meant to be the third instalment of “a life in stone” but it is turning into it). There was no “catalogue”, of course, in my fathers’ business, so the best way for people decide what kind of monument they would like to have was to show them photographs. It was hard to get the polaroid prints to develop in the northern Irish cemeteries, I remember holding them inside my jersey to accelerate the process. Later, I remember pleading with my mother to let me please just take one photograph with the camera please in our garden in Burn road, and she agreed, and I took *my first photograph*, only to discover that half the image was obscured by a blurry blob. First lesson of photography, make sure that your finger is not in front of the camera. Sometime after we got the Pentax, I was eventually assigned gravestone-photographing duties and allowed to take photographs on holiday. The Pentax was a completely manual camera and the possibility of error was significant. I remember one trip we made to the ring of Kerry. Afterwards, when I opened the camera to take out the film, I discovered (with horror) that I had threaded the film incorrectly and not one single image had been exposed (I was terrified to open the box to check, certain that all the film would be lost if I did that, but of course this was not the case).